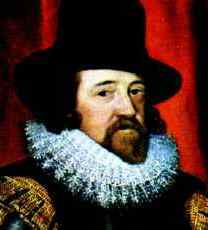 Francis Bacon was born on January 22nd, 1561 in London, England the son of the Keeper of the Great Seal for Queen Elizabeth I, Sir Nicholas Bacon, and his second wife. When he was twelve years old, Francis began Trinity College, Cambridge. He stayed from 1573 until 1575, leaving without a degree. After his father's death, Bacon studied law at Gray's Inn until 1582, when he became a barrister. Two years later, at the age of twenty-three, he was elected to Parliament. In 1597, Bacon published Essays, Colours of Good and Evil, and Meditationes Sacrae. After Queen Elizabeth I's death and the ascension of James I in 1603, Bacon began his political career in earnest. He was knighted in 1603 and several honors followed: Solicitor General in 1604, Attorney General in 1613, Lord Chancellor in 1618, Baron Verulam in 1618, and Viscount St. Albans in 1621. Appointed to a succession of posts, Bacon was finally given the title of Keeper of the Great Seal, like his father before him. In 1620, Bacon published Novum Organum (Or True Directions Concerning the Interpretation of Nature) which asked its readers to let go of Aristotelian ideas and set the foundations for modern science and philosophy. In 1621, five days after the Viscount St. Alban's title was created for him, accusations of bribery were made. Bacon admitted to them, was fined, and then banished from court. However, the sentence was later reduced, and the fine was never paid. Bacon spent only four days in the Tower, but he was not allowed to hold office for the rest of his life. He then moved to Gorhambury to write. Four books followed his banishment from court: Historia Ventorum, Historia Vitae et Mortis (both 1622), Augmentis Scientiarum (1623), and Apothegms (1624). Reports that Bacon helped edit the King James Bible (published in 1611) are still considered lacking a definitive answer, with equal numbers on either side of the debate. In1626, Bacon decided to experiment with the effect of cold on the decay of meat. He purchased a chicken and stuffed it with snow. He caught cold, developed bronchitis, then pneumonia, and died on April 9th, 1626. Bacon's work, Promus of Formularies and Elegancies, a collection of his private notes circa 1594, was first published posthumously in 1883. It included some 2,000 words, similes, phrases, and proverbs (written in English, Greek, Latin, Italian, Spanish and French) that Bacon thought he might want to use in his later literary works. The book is thought by some to provide evidence that Bacon, himself, was the author of the Shakespearean plays ("The Baconian Controversy").